NUS ‘left’ in leadership: fight the reforms! The NUS finds itself in crisis. The Trans Students’ and International Students’ campaigns have been scrapped and the NUS UK Board have put together a programme of reforms in alliance with student union CEOs which block all remaining opportunities for ordinary students to exert control or influence on what NUS does. As we pull into election season it is important that we on the student left examine not just what it is that the candidates are saying but scrutinise their record. How has the dominant nominally left-wing faction (hereafter the soft-left for brevity and political accuracy) has functioned in the national union in the past year? So where was the soft left when the situation became apparent within the NUS? I later learned that, as a faction, the decision had been taken to oppose the cuts solely through the NUS’ internal structures. This was, frankly put, a shocking decision reeking of hubris and an overestimation of their own qualities. Firstly, to imagine for that relatively green officers, themselves bureaucrats-in-training, could outmanoeuvre the professional bureaucrats that have existed within the NUS across generations to restrict potential left-wing activism for decades, using purely insular methods is laughable. Secondly, students had a right to know what was happening. 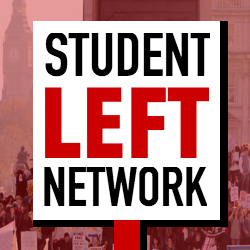 The Student Left Network has essentially been the sole source of consistent left wing commentary on the situation despite relatively little information. Any officer even remotely worthy of being considered left wing in any meaningful capacity should have at a bare minimum leaked all information available to them as broadly as possible. Elected officer posts within the NUS are jobs with more security, despite their temporary nature, than most of us will ever know. The approach taken by the soft left, beyond its insular nature, was not one of principled opposition to these cuts that threaten to turn the NUS into a worthless corporate husk. Rather, it was characterised by capitulation and bet-hedging from the outset. This was an approach based upon stopping certain cuts by offering up alternative areas for the chopping block. An example of this was in an attempt to save the Trans Campaign’s FTO position, the LGBT+ (Women’s Place) FTO position was offered up as an alternative. What was the outcome? Predictably, both positions have been cut. This quite clearly was a wrongheaded approach that failed to grasp the broader context of these cuts. These cuts are an attempt to finish the process initiated under Wes Streeting, the now Labour MP during his time as NUS president. This was a process of stripping the NUS of all its worthwhile elements in favour of a student think-tank-come-discount-provider. Stripping the NUS of its potential as an organisation that could act as a national coordinating body to amplify the strength of campus activism. Making the potential impact of campus activism much more than the sum of its atomised parts. Why then, are we to be convinced that after a year of inward looking inaction, that the soft left candidates have anything to offer by way of the “fighting NUS” that they are campaigning on? It is not clear exactly how they plan to make NUS fight for students when they make no mention of opposing the reforms which gut all last remaining opportunities for debate and take control from ordinary students and place it in the hands of student union management, let alone making any positive concrete demands for democratisation. I will be backing Justine Canady as presidential candidate, alongside others who join the campaign for NUS democracy: a class struggle socialist feminist who recognises the need for the extension of NUS democracy and the potential of the NUS as a means of amplifying the campus-based struggles taking place today, linking groups up nationally and giving some teeth back to the student movement.